Compact and connected – The simple solution for printing from smartphones and cameras. The compact photo printer for lab-quality prints anywhere. 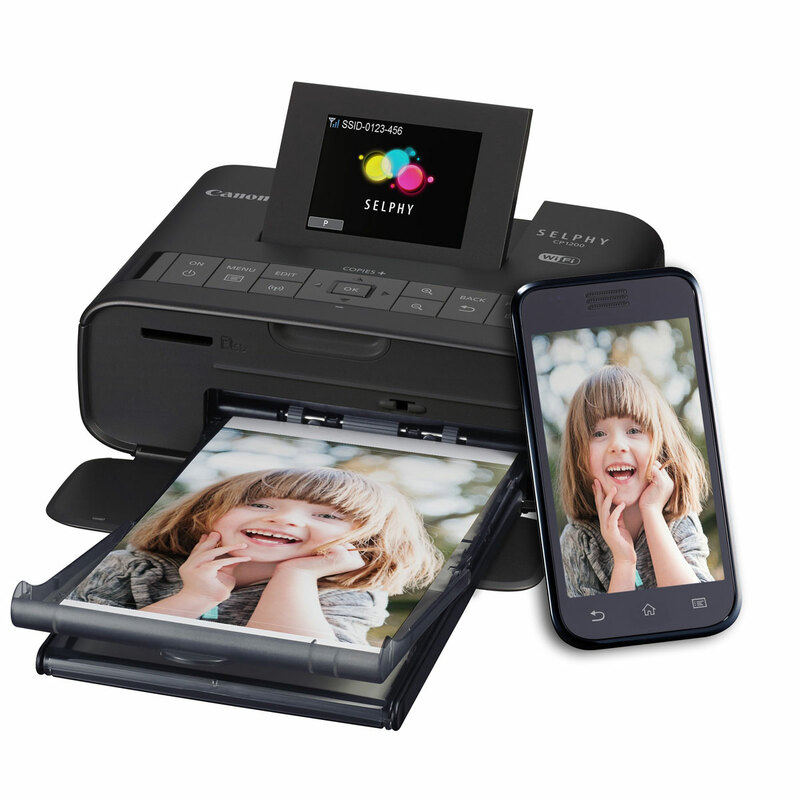 With Wi-Fi and AirPrint™ support, it is ideal for wirelessly printing from smartphones and digital cameras. Ultra-compact, portable photo printer. The SELPHY CP1200 photo printer fits perfectly anywhere in your home, and it’s portable enough to take to parties and family events. Enhanced Wi-Fi connectivity. Wi-Fi support lets you print quickly and easily from compatible cameras and PCs without a cable. See it, snap it, print it. In-built wireless access point lets you connect and print directly from your smartphone. For ultimate ease, AirPrint™ support lets you print from compatible Apple devices without installing any software. Lab-quality printing at home. Anyone can print professional quality, long-lasting photos in less than 1 minute. Dye sublimation technology provides superb depth and colour gradation without the wait. Memories that last. A special overcoat protects each print against splashes, spills and fading, lasting up to 100 years when stored in an album. You can even apply a semi-gloss finish to further prevent fingerprints and create a similar feel to traditional lab prints without the need to change any consumables. Simple to use. Anyone can print with the user-friendly design that includes a tilting 6.8 cm (2.7”) LCD for easy viewing and intuitive menus with on-screen instructions for simple navigation. No surprises. Stay in full control of the printing costs with a defined number of prints with every pack of consumables. Print your way. For quick prints just connect your PictBridge-compatible camera directly to the printer. You can also print from a range of memory cards or from USB flash drives for greater flexibility. ID Photo Print. Whether for personal or professional use, ID Photo Print with Face Frame Guide lets you create and print ID photos in a wide range of accepted sizes. Range of print sizes. The printer offers many ways to share your memories including postcard, square or credit card sized prints – all in super-quick time. Enhance your photos. Auto Image Optimize with Scene and Face Detection ensures superb results. It intelligently corrects image imperfections while reducing unwanted noise, giving your prints extra clarity and richness. Printing on-the-go. Print on the move indoors or out with the optional rechargeable Battery Pack NB-CP2L (requires CG-CP200 Charger Adapter). A single charge delivers over 36 postcard size prints. Optional Dust Cover DPC-CP100 ensures quality prints even when printing outdoors.